You are here: Jinydoor > Blog > Why are Fiberglass Doors Popular? 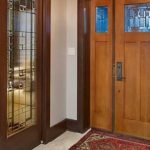 Why are Fiberglass Doors Popular? Fiberglass doors are most in demand as exterior doors, for interiors or windows. It is due to their various features that these doors are popular amongst owners and business groups. Fiberglass doors are made up of plastic reinforced with the help of glass fibers. These are very durable and cheaper than any other doors in the available currently. Another feature that makes these doors even more desirable is that they are stronger than metal doors of the same weight. Thus, fiberglass doors are a complete package of durability, security, performance and affordability. Fiberglass doors have a swing style operation and can be easily installed anywhere, making them easily accessible. You can also purchase these doors online through many popular e-commerce websites. They are easy to install and require negligible maintenance. The research on the development of fiberglass began extensively during the 1930s. The main focus was to develop it for commercial use. The aviation industry was also interested in fiberglass. It was finally in 1932 that the mass production of glass fibers was started. Since then fiberglass has found multiple uses and fiberglass doors are the most common ones. We can find such doors in almost every house or office mainly due to their endurance and wide range of features. Fiberglass doors are popular for their user-friendly features. Right from production, installation and performance, fiberglass doors never disappoint anyone. The production of fiberglass doors is easy and companies take bulk orders. Production of these doors takes very little time. These doors are available in different sizes and weight according to your requirement. There are available in a variety of colors, which makes these doors look even more elegant. Unlike other doors, fiberglass doors are available in a number of beautiful designs. Because they are easy to produce, these doors are also quite reasonable priced. Apart from the various colors and designs, fiberglass doors can also be custom modified and coated with desired paint to suit the customer’s need. Fiberglass doors also offer resistance from the weather and protect the inner atmosphere from getting affected. It is a bad conductor of cold and this proves advantageous in cold weather by protecting the interiors from cold temperatures. Fiberglass doors require low maintenance and are resistant against all the natural adversities. The advantages of fiberglass doors are many. They have an edge over other types of doors available in the market at the same price, or even higher. The advantages of installing fiberglass doors ranges from its design to durability. Some of the most important advantages of fiberglass doors have been listed below. 1. Variety of designs: Fiberglass doors are available in a wide range of designs as compared to the other doors available in the market. The designs can give the look of wood or steel doors and enhance the elegance of your entrances. The appearance of wood or steel can be achieved with the help of fiberglass doors at a very low rates without any extra cost. 2. Durability: The biggest benefit of fiberglass doors is their durability and capacity to last long without any maintenance. Besides its elegant look, it gives a much better performance in terms of durability in comparison to wood or steel doors. These fiberglass doors are designed to withstand a difficult situation. 3. No dents or peeling: While steel doors are prone to getting dented or rusted, fiberglass doors are safe from that vulnerability. The doors will never look faded since they don’t rust. The tough scales of fiberglass doors don’t peel even due to harsh weather conditions. 4. Easy installation: Fiberglass doors are available in the market as a whole set of doors which makes them easy to assemble and install. It comes pre-hung with its hooks and can be placed at any part of the house. It can be installed as an exterior entry door or interior room doors. 5. Cost efficiency: The major benefits of fiberglass doors also include the low-prices of these doors. Despite being durable, tough and strong, these doors are easily available and affordable. The variety of designs and wood-finish and steel-finish doors are available in fiberglass doors at a much lower rate. You can get the same finish as wood and steel doors with many additional properties at low rates by using fiberglass doors. 6. Security: Doors made up of fiberglass are very durable. They keep the elements away without allowing any access to trespassers. These doors can make you feel safe and secure. These safety features are additionally installed by companies to further increase the level of security. 7. Warranty: Since these doors are durable and have a long life, the company’s manufacturing these doors do not refrain from giving additional warranty to customers, which acts as a backup in case the doors are damaged within the period. This also helps people choose fiberglass doors over others since they are secure and do not have to face a loss. 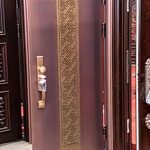 The warranty feature takes the popularity of fiberglass doors a step further as compared to other doors in the market which don’t offer any warranty. For all these reasons, and many more, fiberglass doors are reckoned to be the best in the market as compared to other doors. They offer a number of features and their performance I exemplary. Every customer would like value for their money by purchasing something that is durable and has strong competitive properties. These doors are available in multiple designs and looks that add to their popularity. Fiberglass doors invoke trust in their users, because of the number of advantages they have. These doors are easily available online or even in the local furniture market near you. Their easy availability and low rates are the primary reason why most people choose these doors over other doors available in the market. 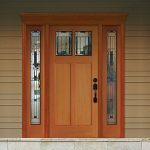 What Type of Front Door Material Is Right for Your House-front door supplier?